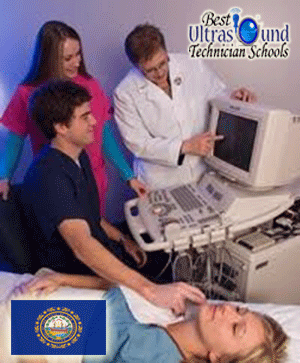 One of the smallest states in the union, New Hampshire only has one school that offers an accredited sonography tech program. New Hampshire Technical Institute, Concord's Community College (better known as NHTI Concord's Community College) is a two-year institution of higher learning located in Concord, the state's capital. The school offers a Professional Certificate in Diagnostic Medical Sonography, which is accredited by the Commission of Accreditation of Allied Health Education Programs (CAAHEP). The curriculum of NHTI Concord's sonography program consists of 50 semester credits. It is designed for completion within two years: a full first year consisting of the Fall, Spring, and Summer semesters; and a truncated second year with just the Fall semester. Each of the training program's four semesters has a DMS Clinic, in which students gain hands-on experience that includes performing medical imaging with sophisticated ultrasound instrumentation. The lab exercises prepare students for a profession that would place them in hospitals or private clinics. Other classes offered in the NHTI program include Sonographic Anatomy and Pathology, Sonographic Principles of OB/GYN, Sonographic Physics, Seminars in Sonography, and Principles of Vascular Ultrasound. For admission to the program, applicants must have completed an associate or bachelor's degree program in an allied health science; eligible specializations include radiologic technology, nursing, and physical therapy. (Medical assisting is not included) NHTI strongly recommends knowledge in medical terminology, and applicants must complete a course in Cardiopulmonary Resuscitation and Airway Obstruction Management for the Healthcare Provider/Professional Rescuer before they register for the program. Diagnostic medical sonographers in New Hampshire made a median yearly income of $75,000 ($36.07 per hour) in 2012, according to the U.S. Bureau of Labor Statistics (BLS). This is higher than the national median of $65,900 ($31.66 per hour). The bottom 10 percent made a median annual wage of $62,000 ($29.81 per hour), while the top 10 percent took home $91,100 ($43.78 per hour). According to the BLS, there were 220 diagnostic medical sonographers in 2010, and the agency expects the number to be 290 by 2020: a 34 percent increase.